A star-shaped polymer is being harnessed by a University of Melbourne team to kill superbugs. 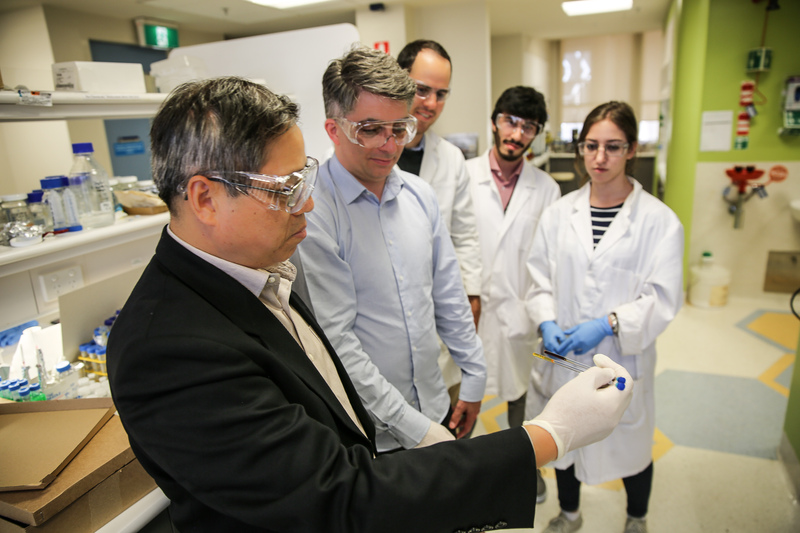 Professor Greg Qiao and his colleagues from the Melbourne School of Engineering have created an amino acid polymer that kills antibiotic-resistant bacteria by ripping apart their cell walls. The rise of antibiotic-resistant superbugs is one of the world’s greatest health threats, according to the World Health Organisation, which predicts 10 million deaths due to superbugs by 2050. Significantly, the bacteria showed no sign of developing resistance to the polymer. A strength of the polymer is it targets bacteria via several pathways, which includes ripping apart cells walls, unlike conventional antibiotics which only use one pathway. Banner image: Prof Greg Qiao, Associate Professor Neil O’Brian-Simpson, Dr Steven Shirbin, Dr Ignacio Insua, Alicia Rasines Mazo. Published in Stories of Australian Science 2017.